SCOTTSDALE, Ariz., Nov. 16, 2017 /PRNewswire/ -- Home design trends change constantly, and sometimes not fast enough. While many of us anticipate the trending paint colors of the year, and keep up with real estate television shows and websites, the reality is most of our own homes have outdated elements. In fact, 70 percent of new or prospective homebuyers report having outdated design features in their current homes. The six most common culprits for remodel-worthy features are linoleum floors (40 percent), popcorn ceilings (29 percent), wood paneling (28 percent), ceramic tile countertops (28 percent), shag carpeting (19 percent) and the dreaded avocado green appliances (8 percent)—according to a consumer survey conducted by Wakefield Research on behalf of Taylor Morrison Home Corporation (NYSE: TMHC), a leading national homebuilder and developer. "This is why real and virtual house hunting is so popular," said Sheryl Palmer, Taylor Morrison chairman and chief executive officer. "We all love to daydream and envision ourselves in a beautiful new environment. But keeping up with ever-evolving preferences for paint colors, home features, new technologies and how we expect to use our homes over the years, is difficult. We also know that home interior preferences vary by generation, by home style, by region, even by city. So Taylor Morrison relies on national consumer feedback and acres of research to help us stay hyper-focused on what homebuyers want, and address changing interests—across all generations." Which features bring more homebuyers to new homes? Better energy efficiency (62 percent), floor plans that can be personalized (58 percent) and easier maintenance (56 percent), are surprisingly preferred over items like the latest technology (38 percent). Inside a new home, wood flooring (65 percent) is considered the most essential feature, followed by USB and Ethernet ports (44 percent), a whirlpool tub (36 percent) and sun room (34 percent). Millennials showed more of an affinity than older generations for a whirlpool tub (39 vs. 32 percent), home theater (30 vs. 24 percent) and wine refrigerator or cellar (21 vs. 12 percent). Who says millennials don't know how to live? Earlier this year, Taylor Morrison unveiled a home designed for today's active adult, which was heavily influenced by consumer research, focus groups, surveys and social data. The NEXTadventure Home includes more storage, a supersized shower, and an additional room that can flexibly be used as an office, guest room, or secondary bedroom—which some affectionately call a snore room. "We interviewed hundreds of homeowners, collaborated with leading designers, and crafted an award-winning home specifically for busy boomers," said Erik Heuser, Taylor Morrison executive vice president and chief strategy officer. "And that also included a place to get some sleep and not disturb your partner." 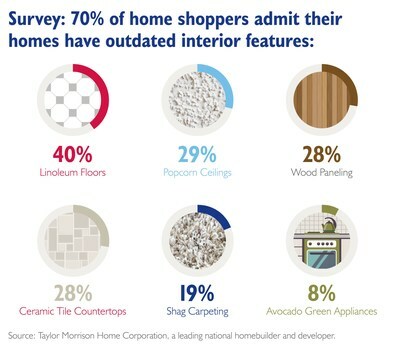 Taylor Morrison home shopper survey data reveals that millennials, just as much as any other generation, still want to have dining rooms in their new homes. When all generations were asked to describe how they use their existing dining rooms, 80 percent of boomers creatively said, "I use it as a dining room," versus 65 percent of millennials who are interested in nontraditional uses of this traditional space. In fact, more than one in four (30 percent) of those with a dining room say they use this space for something other than dining, and most often as an office, game room or craft room. "What this tells us, is that younger homebuyers still prefer a more traditional layout, but when it comes to how we all use that space, as a homebuilder we need to provide flexibility so dining rooms can be used in a multitude of ways," said Heuser. 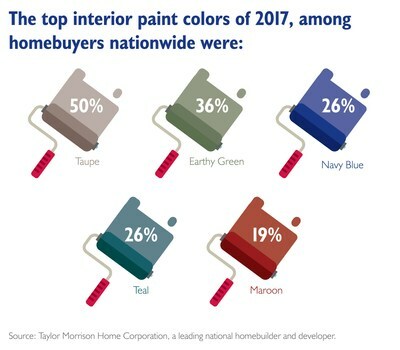 The survey unsurprisingly revealed that soft natural tones (77 percent) were the more popular interior paint colors for recent and prospective homebuyers. However, get out your paint brushes because deep, rich tones (54 percent) could soon take over. Nearly three in five (59 percent) millennials want the interior walls of their home painted with darker, rich colors, compared to just 49 percent of their older counterparts. The 2017 Taylor Morrison Consumer Survey was conducted by Wakefield Research on behalf of Taylor Morrison earlier this year. Wakefield Research surveyed 1,000 U.S. adults who have purchased a home in the last three years, or who are likely to purchase a new home in the next three years. Taylor Morrison Home Corporation (NYSE:TMHC) is a leading national homebuilder and developer that has been recognized as the 2016 and 2017 America's Most Trusted® Home Builder by Lifestory Research. Based in Scottsdale, Ariz., we operate under two well-established brands, Taylor Morrison and Darling Homes. We serve a wide array of consumer groups from coast to coast, including first-time, move-up, luxury, and 55 plus buyers. In Texas, Darling Homes builds communities with a focus on individuality and distinctive detail while delivering on the Taylor Morrison standard of excellence.